This month, I’m launching my third online product, Zubtitle. Here are the tough lessons I am learning (again). I have two things happening in my life right now: (1) I am confined to my couch recovering from ankle surgery and (2) I just launched a new video marketing/editing product. I hope I don’t hit a level of boredom where I begin writing about my surgery. However, I do want to get a few thoughts down about this product launch. In my 3 years of entrepreneurship, this is my 3rd product launch and I am reminded again how f***ing difficult this stuff is. The first product I launched was a mobile social audio app that let communities interact by sharing short audio clips. It gained a decent amount of adoption but we weren’t able to build a business around it. We wound up selling that product in late 2016 (but keeping the brand) and launching Wavve in early 2017. Wavve has a more straightforward SaaS business model and is doing well with over 1,000 monthly premium subscribers (and growing ?). This month, I launched Zubtitle. Zubtitle is an online tool that automatically adds captions/subtitles directly to your videos to better prepare them for social sharing. Subtitles are proven to increase video engagement & reach but there has never been an easy way to automatically add text and captions to videos. ? That is what we are trying to solve. It’s always a bit nerve-wracking to launch a new product. There is a natural tendency to hold on to our creative works and not release them to the world for fear of the negativity and criticism we might receive. But… at some point, you have to say F**k It and put the thing out there. Which we just did. With my past experiences, I thought this would get easier. While we have had a few paying customers come through in the first two weeks, I am being reminded of a few important lessons. In hindsight, calling this a launch is a little dramatic. We are really just releasing our software to the world wide web in its current functioning state. The goal is to get the product out into the world as soon as possible and market it just enough to get the feedback you need. You can always ramp up marketing efforts but it’s hard to stop traffic when it’s coming in. Most users only give you one chance. I prefer not to waste that chance early on. Quietly launching a new product and taking the time to manually introduce it to a small segment of users prevents you from wasting that 1st impression on a large audience. This was the biggest mistake I made during my 1st product launch a few years back. I asked everyone for feedback (and cared about what they said). Your initial goal from day-one should be getting paying users. Nothing else. Soliciting feedback only from potential customers keeps you focusing on building & refining the bare minimum features needed to get your first sales. It’s important to establish a specific desired outcome for users that indicates success. For us, it’s the creation of a subtitled video (which requires payment). This is our product north star. If a user doesn’t do this, something went wrong. There are a lot of ways to ensure that users are making it through the product funnel. I prefer a mix of analytics and manual outreach. Regardless of how you do it, find the leaks in your funnel and fix them before doing anything else. In our first 30 days, 17 people have found us via organic search. Next week I will make it 30, then 60, and so on. 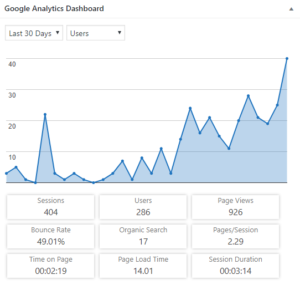 Our low bounce rate & pages-per-sessions mean users are engaging with our site. It’s up and to the right! It’s tempting to want to start a few brush fires. i.e., Spend a few hundred dollars on Adwords or start reaching out to influencers to share your product with large audiences. When done too early, this usually brings you back to square one with only minimal learnings. Instead, focus on evergreen marketing content and plant trees: SEO, Youtube videos, podcasts interviews, case studies, etc. These pieces of content have long lifespans and work together to build authority around your domain. This helps target your audience early on and creates an inbound marketing machine that one day will resemble a snowball. It took us 6 months to hit $1k monthly recurring revenue with Wavve. A year later, it’s now generating $164k in annual recurring revenue. It’s been 2 weeks and Zubtitle has made $10. This stuff takes time. Be patient, don’t quit. P.S. — If you made it this far, drop a comment and let me know what you think. I plan on starting to write more content like this and your encouragement would be appreciated. Follow me on Twitter, Instagram, & LinkedIn. Great post man! Is there anything specific you’re doing to try to build that organic search traffic? I started by laying down some comments on Reddit & Quora posts. I also put out a few how-to blog posts and an educational post on why captions are important to add to videos. Quora is driving the most traffic so far! Greetings from SCHS days that have long since passed. I’ve been keeping up here and there on LinkedIn since you launched Wavve. Being in the tech world, it’s refreshing seeing new products being driven to the market! Keep up the good work man! Hey Ryan! Great to hear from you man. You still have that smooth baseball swing (lefty if I remember correctly…)? Glad to hear it. Trying to get more thoughts out into the world, whether that is a good or bad thing 🙂 Appreciate the encouragement! I enjoyed reading this man! It’s great to hear about the true side of entrepreneurship. Keep it coming! Haha, I wish I was a lefty…their swings are always buttery smooth. Looking forward to seeing what other concepts you’re able to launch!